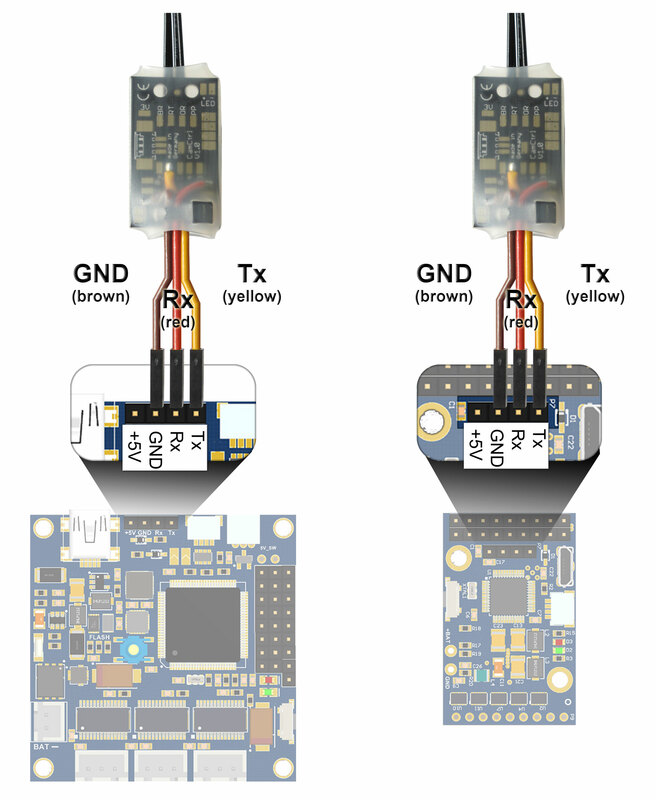 The gibmal is directly controled via data bus, so no additional servo channels are necessary. The current angles of the gimbal are read and recorded in the log files. As a result, in postprocessing, e.g. the inclination of the gimbal can be assigned to the corresponding photo. 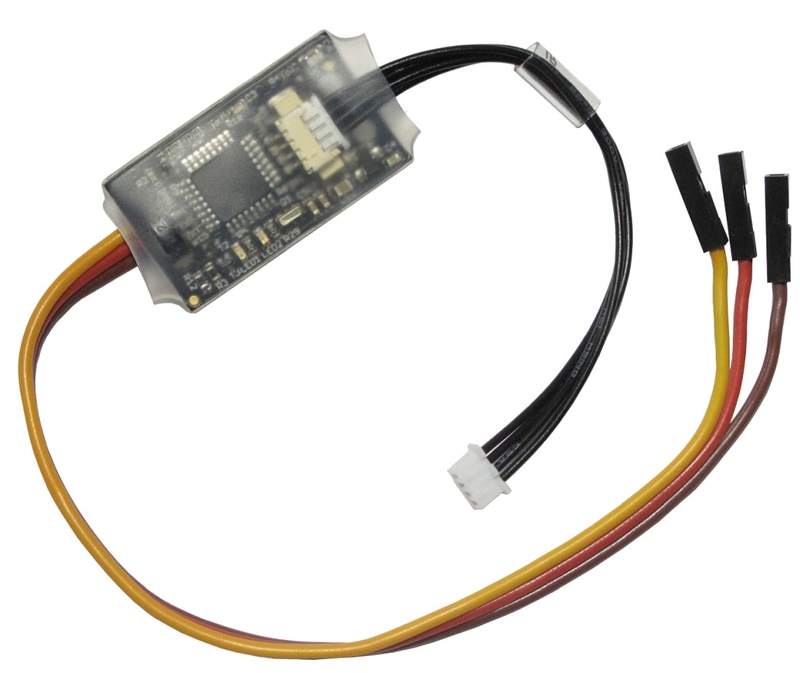 The GimbalCtrl is connected via I2C plug connection to a FlightCtrl V3.0. If this is connection is already in use by other hardware, then an I2C bus splitter can be used. The interface is connected to the AlexMos controller with 3 lines (RxD, TxD, GND). The cables must be connected according to the AlexMos hardware. There are also 3 special outputs available on the interface: OUT1 & OUT2 are general purpose outputs that can be assign to e.g. a RC channel in KopterTool. For example to switch between display modes of a special IR camera. OUT3 is a mapping of the normal photo trigger output to connect a shuttercable. So you can control a lot of features using only a few I2C lines. This makes it a lot easier to connect gimbal and cameras (less wires). The outouts are only available as solder pins. Connecting has to be done by the customer. 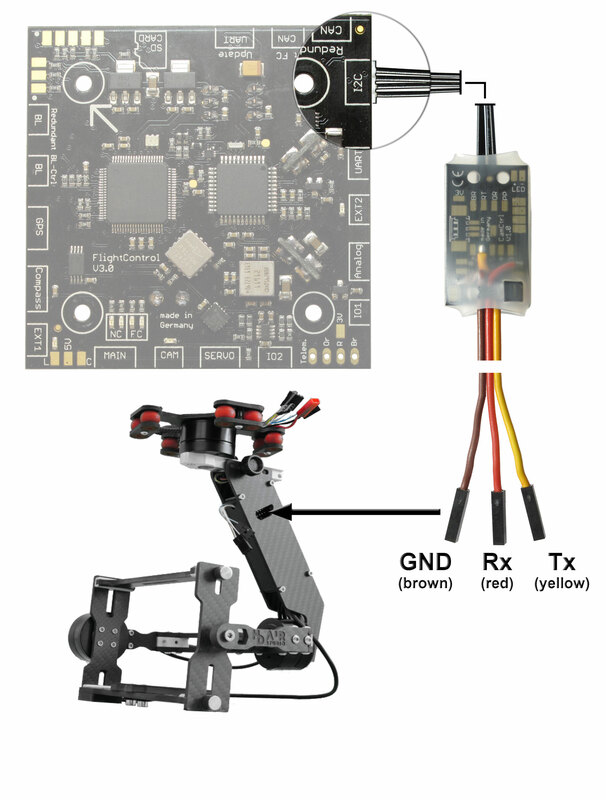 AlexMos board type Extended have a problem using the serial with our GimbalCtrl. It is possible that you have to remove two resistors on that board to make it work. More details in our wiki.